The dark clouds that filled Toronto's skyline early Thursday evening (August 13) signalled the doom and gloom of a storm system passing through, though they could have also easily announced the arrival of High on Fire and Pallbearer at the Opera House in the city's east end. In support of the former's seventh studio record, Luminiferous, the second Canadian date on their North American trek saw the two bands wreak heavy metal havoc on a fiercely dedicated audience. Primed by opening performances from sludgy GTA natives Olde and the dark, magical Lucifer, the stage was set for the inclusion of even more crushing elements. A recent problem for Arkansas outfit Pallbearer on trips to the Great White North has been getting bassist Joseph Rowland across the Canadian border; like their previous Toronto appearance this past April, the group were forced to operate as a trio, without Rowland's low end. With the volume level that Brett Campbell and Devin Holt had their drop-tuned guitars at, though, additional lower frequencies might not have made much of a dent in their wall of doomy, muscular six-string work, which was guided forth by the steady hands of drummer Mark Lierly. Opening with the ten-minute "Worlds Apart," Campbell did well in not letting the overdriven guitar overpower his lead vocals, coming through cleanly in moments that required his higher register on "The Ghost I Used to Be" and "Foreigner." Unfortunately, his lead guitar work didn't fare as well, with the furious solo section of "Devoid of Redemption" ending up lost amidst the roaring riffage. Much of the depth and detail that came with last year's standout disc, Foundations of Burden, was lost to the straightforward live setup, yet didn't make the music any less appealing, as the crowd remained entranced by each lumbering passage. Already quite used to life as a trio, High on Fire took it upon themselves to liven up the audience, barrelling through "The Black Plot" to open their set. 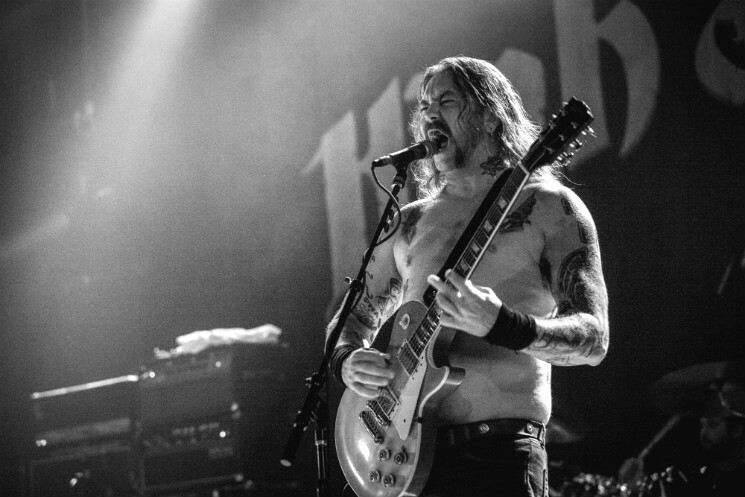 Leading the charge was Matt Pike, predictably shirtless and sporting a mean handlebar moustache, making him look all the more fierce as he snarled out the name of each song before playing it. With the set dominated by cuts from Luminiferous, Pike's guitar playing remained a consistent highlight as he tore his way through the power-packed rhythm parts of "Carcosa," "The Falconist" and "The Dark Side of the Compass," the audience throwing their flailing air guitar fingers forward each time he approached the stage front. His soloing was nothing to scoff at either, as he wove searing melodic leads through "The Sunless Years" and melted a few faces as he shredded through the thrash-oriented "Slave the Hive," which incited a mosh pit within seconds. Pike's work would be nothing, though, without the rhythm section of Jeff Matz and Des Kensel, a duo who only continue to surprise with each release. Behind Matz's heavily distorted bass was Kensel's unflappable presence behind the kit, working a thunderous double-kick in combination with the crashing drum fills of "Death is This Communion." Eager to please the large contingent of day-one supporters in attendance, Pike and company went back 15 years to play "10,000 Years" from 2000's The Art of Self Defense, before an encore featuring the pulverising "Fertile Green" and the intricate soloing of "Snakes for the Divine" sent the devoted home happy.